Hansaton acts to improve quality of life and support hearing impaired individuals, as per their mantra, with the SHD model 5 hearing aid. Complete with 12 channels and 7 programs, hearing becomes an experience again. The new SHD ‘sphere’ technology acts on noise in a fully encompassing manner, for optimal detection, localisation, optimisation and separation of acoustic signals, because after all, hearing is a 3D experience. Localisation and intense focusing occurs with ‘Speech Beam’ and ‘Speech Sound’ elements, to improve speech precision from a variety of surrounds. This surround sound experience allows conversation in both noisy and quiet conditions, around crowds and small groups, to no longer be an issue for your hearing ability, with it’s ‘Auto Surround 6’ platform. Hansaton also highlights a desire for comfort whilst gaining highest potential optimisation via ‘Situation Optimiser’, ‘Acclimatization Manager’ and ‘Conversation Lift’. ‘Situation Optimiser’ removes the constant need to alter program or volume settings by combining the precisely correct input, of which can be logged and stored, with adaptive output, to create the most optimal result. ‘Acclimatization Manager’ works with XearA technology to adjust settings in a mild, gradual manner, to find the most favourable setting for you. A multi-directional microphone setup allows intelligibility of speech to improve, through the use of ‘Conversation Lift’. Wind block occurs via an active process, in combination with ‘Sound Restore’ properties, to make even the toughest of environments an ease for your ears. 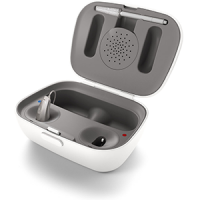 BiLink programming acts to configure binaural processing between both hearing aids, while the BiPhone platform converts the speakers’ voice from the phone ear to the other ear via their aid, to improve speech outcomes and clarify conversations. 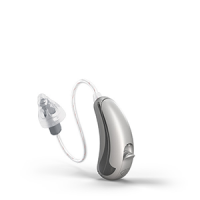 Available in at least 7 shades, the only decision to be made is your colour choice, as hearing outcomes are taken care of with the most extensive technology. In comparison to the SHD 5 model, the 3 does not cope so well in crowded situations, where noise surrounds you at a high volume. Additionally, featuring a mere 8 channels, specificity is reduced for the user with the SHD 3. Dependant on your lifestyle, the 5 model offers flexibility to your activities, able to cope in any situation, while the 3 model is for the more subdued user. Overall, Hansaton brings you a premium product with the SHD 5, able to cater to all your hearing needs. Despite being a new contender to the hearing aid scene, they are worth your trust.